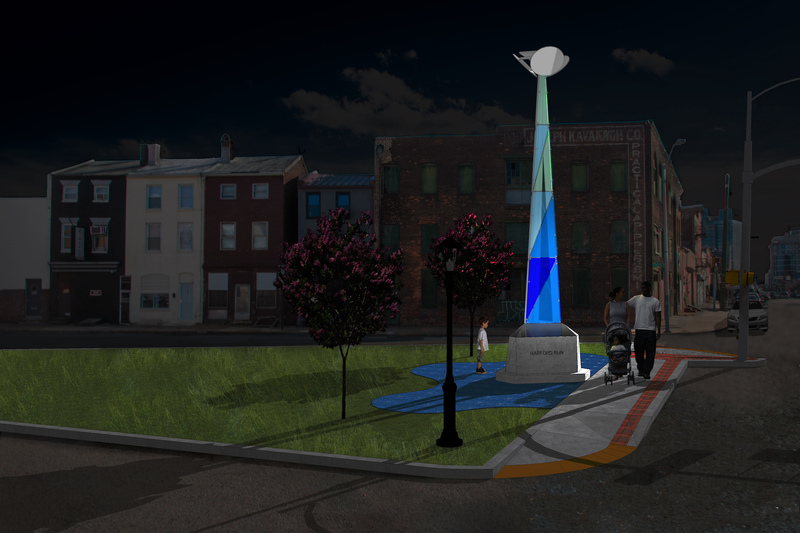 The Baltimore City Public Art Commission approved FGLA’s public art concept for an interactive Periscope tower and plaza at the intersection of Central Avenue and Pratt Street. This work is the percent-for-art commission part of the Central Avenue streetscape project. The Periscope’s angled mirrors will make it possible for people walking by to see elevated views of the neighborhood. Its color, form, and integrated plaza are inspired by local waterways, including City Springs, Harford Run, and the Patapsco River. 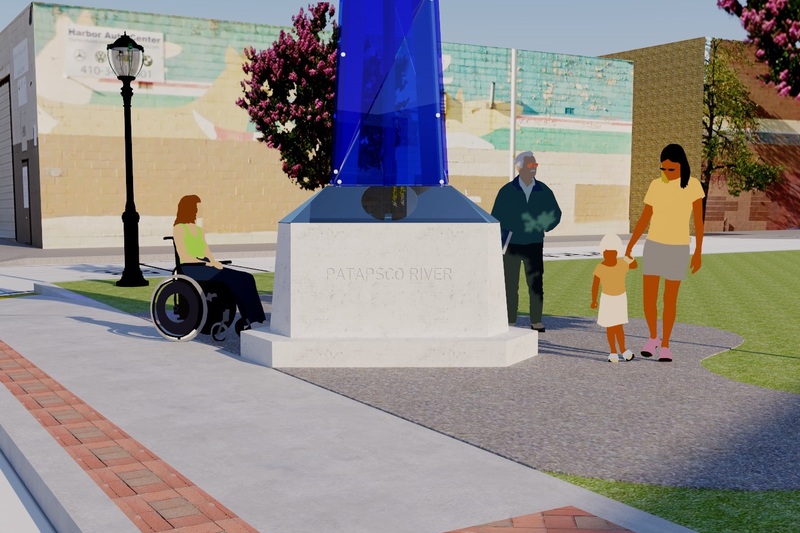 The 25’ tall Periscope will be constructed of cast-in-place concrete, colored plexiglass supported by a welded frame, and surrounded by a plaza of integral color concrete. Inscribed on the obelisk pedestal will be the names of the three local water bodies that makeup the watershed where the Periscope stands. The triangle crossing at Pratt Street offers a unique opportunity for a truly public, plaza-like place along Central Avenue. The angled intersection provides panoramic views of Baltimore’s diverse pasts and futures. From this vantage one can see historical rowhomes, public housing in transition, public art, and ongoing development up and down Central Avenue. The view facing east frames City Springs school, which takes its name from a spring that once existed where its athletic field now lays. 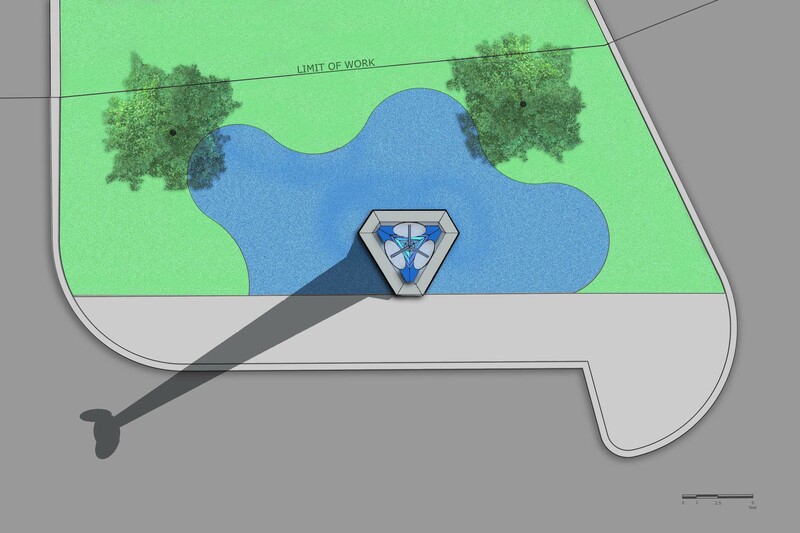 Synthesizing these views, Periscope will stand as an obelisk-like monument to water in place and pedestrian oversight. 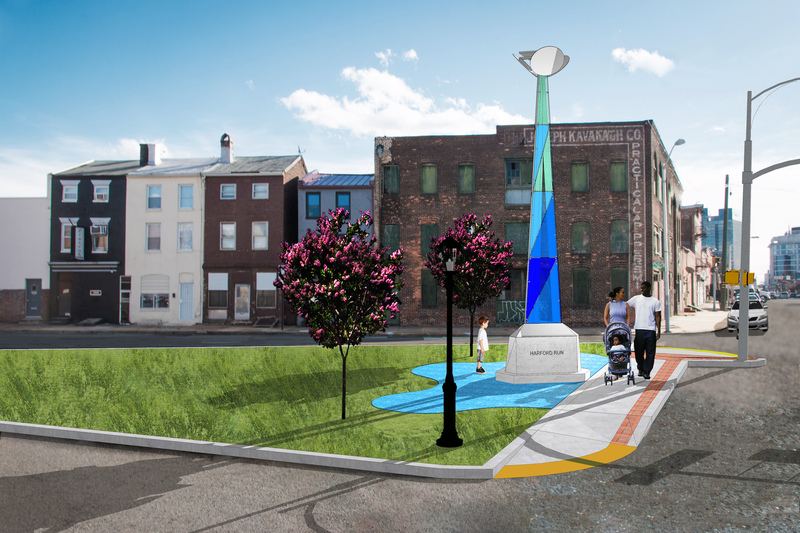 Inverting the hierarchy of Baltimore’s omnipresent blue surveillance lights, the tower will empower pedestrians with elevated views of their surroundings while colorfully evoking the water cycle of precipitation, collection, and flow. Periscope will be fabricated and installed in 2019. Falon Graham Land Art (FGLA) is the public art team of Falon Mihalic and Graham Coreil-Allen. Periscope nighttime view facing southeast. Periscope street view perspective featuring periscopic mirrors reflecting a nearby building. Periscope plan feature blue integral color concrete plaza.